The table or area where snacks are located are often affectionately referred to as "Crafty". The Craft Services person is a film crew position that handles general snacks and beverages for the crew throughout the shooting day and is separate from the full-meal services provided by catering that supplies a hot breakfast, lunch or dinner (with expections). For feature films, television shows, commercials and some other projects that have appropriate sized budgets, there may be a full sized catering truck that provides hot meal services. In this case, the film crew may go to the catering truck or chaffing dish set-up for all their meals begining with breakfast. 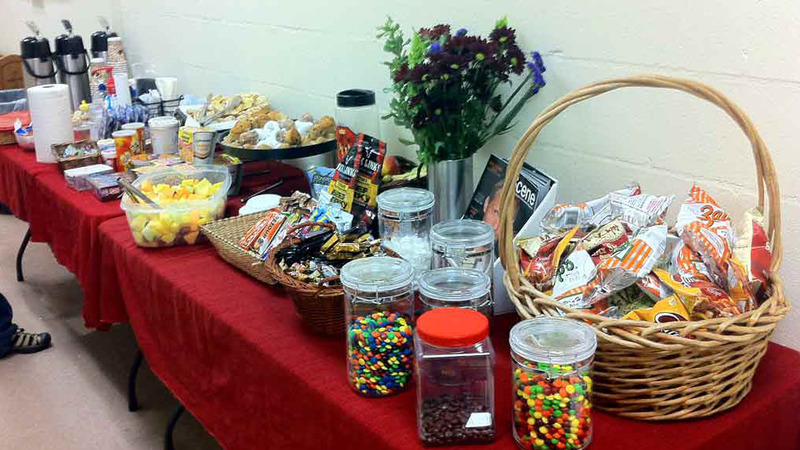 When catering handles breakfast, throughout the day, craft service is only responsible for proviing snacks and beverages to the shooting crew between meals provided by catering. If the job is samller in budget, craft service is often tasked with providing a hot breakfast for the crew instead of a complimentart 'continental breakfast' consisting of just bagels, coffee and/or donuts.